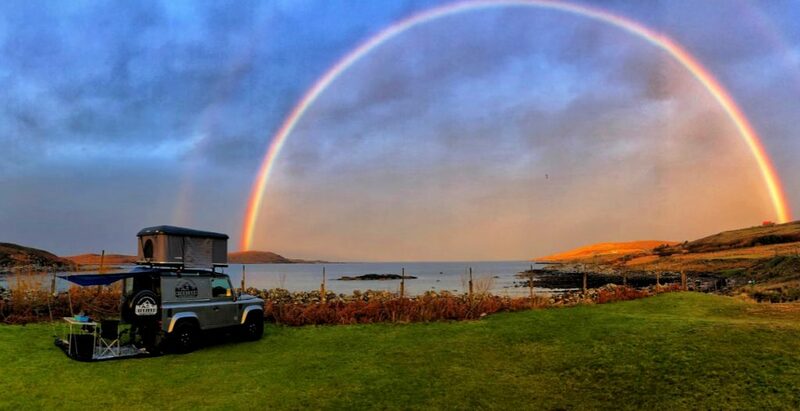 Come to the Highlands of Scotland and hire the ultimate overland adventure! 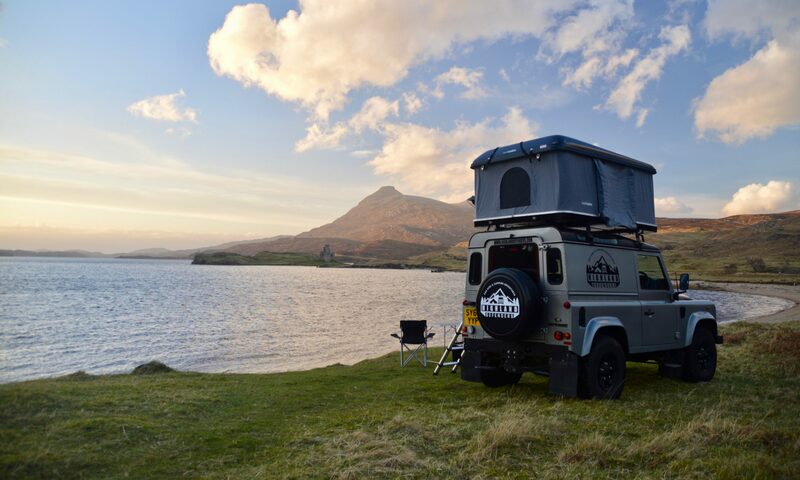 Our Land Rover Defenders are all fitted with hard shell roof tents and are equipped with all the camping kit you’ll need for your Scottish road-trip! Defenders offer an unrivalled combination of class and go-anywhere ability that means they feel at home in almost any situation. Fitted with chunky all-season tyres, you have a hugely capable vehicle with a vast loading area, ground clearance to spare and will get you to your destination regardless of what the Scottish weather throws at you! Our roof tents are supplied by industry leaders iKamper and Roof Cabin, guaranteeing their comfort and quality. 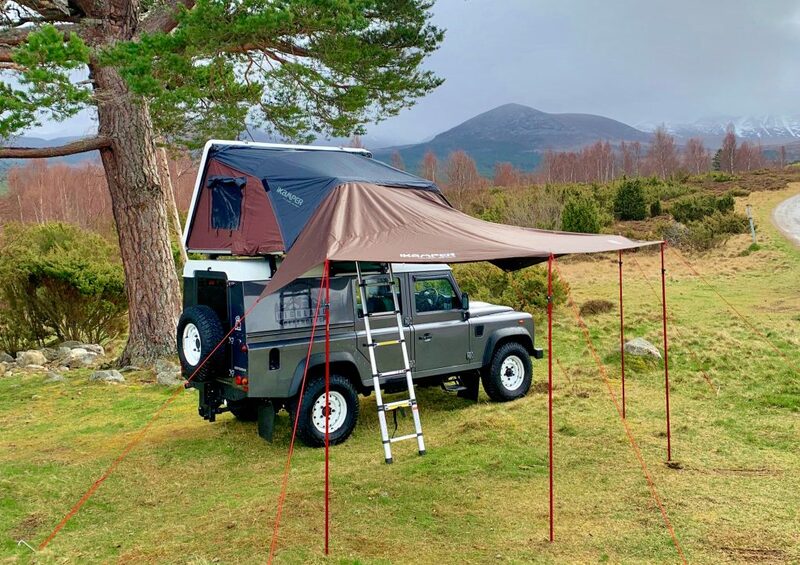 These hardshell tents come with numerous benefits, including setup times of less than a couple of minutes, fantastic weather protection, inbuilt mattresses, elevated views from their 4 windows, telescopic ladders and the ability to simply park up your Defender and rest! Our camping kits are comprehensive and include everything you will need for your adventure; sleeping bags, stove and cooking equipment, table and chairs plus much more! We feel this is the perfect solution for those planning a Scottish adventure; Munro bagging, island hopping, discovering the NC500; all made so much easier with the freedom of stopping where you want, when you want. With a wealth of knowledge, our team are here to help plan your trip to the Scottish highlands, with itinerary suggestions for nature or history highlights, adventure excursions, family fun and lots more to get the very best out of your booking. 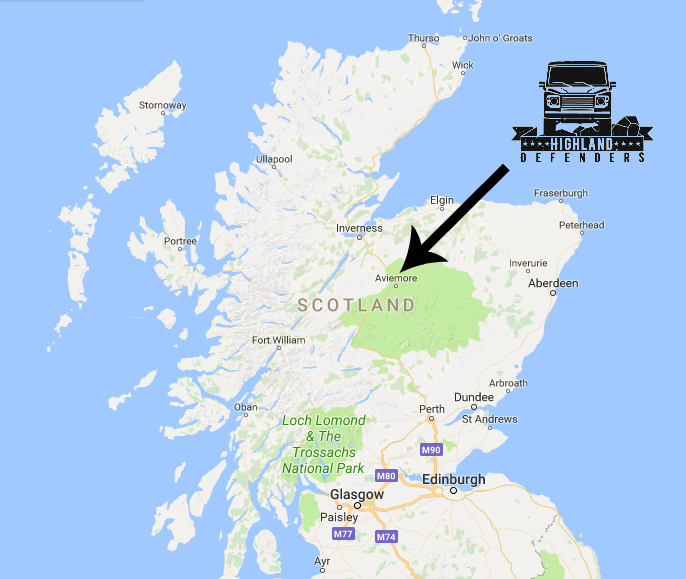 We are located in the centre of the Cairngorms National Park in Aviemore, just 30 minutes from Inverness and the NC500. Reaching us is easy – by air, rail or road. ROAD: You can reach us via the A9. We are minutes from this main road that connects the north of Scotland to the rest of the UK. RAIL: The Caledonian Sleeper stops at Aviemore train station. We will meet you at the station with your Defender free of charge. This is a great option as you can hop on the train in London, relax overnight and arrive bright and early in Aviemore refreshed and ready for your adventure. AIR: We are 30 minutes from Inverness Airport. We can arrange your transfer to and from the airport. Please get in touch for more info! Arriving in Edinburgh, Glasgow, Aberdeen?  We are now offering transfers to and from these destinations. Again, please get in touch for more info!